Shane Claiborne is a bestselling author, renowned activist, and sought-after speaker, and is a self-proclaimed "recovering sinner." He writes and speaks around the world about peacemaking, social justice, and Jesus, and is the author or coauthor of numerous books, including The Irresistible Revolution, Jesus for President, and Executing Grace. Claiborne is the visionary founder of The Simple Way in Philadelphia and president of Red Letter Christians. His work has been featured in the Wall Street Journal, Christianity Today, Esquire, and SPIN and on Fox News, NPR, and CNN. He did graduate work at Princeton Seminary and received an honorary doctorate from Eastern University. Claiborne lives in Philadelphia, Pennsylvania. Follow him on Twitter (@shaneclaiborne), on Facebook (ShaneClaiborne), and at www.redletterchristians.org. Michael Martin is founder and executive director of RAWtools Inc. and blogs at RAWtools.org. 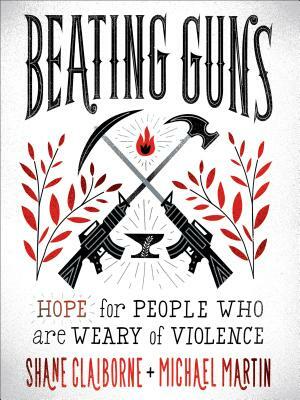 RAWtools turns guns into garden tools (and other lovely things), resourcing communities with nonviolent confrontation skills in an effort to turn stories of violence into stories of creation. RAWtools has been featured in the New York Times and on Inside Edition and NPR. Martin previously served as a youth and young adult pastor in the Mennonite church and lives in Colorado Springs, Colorado.